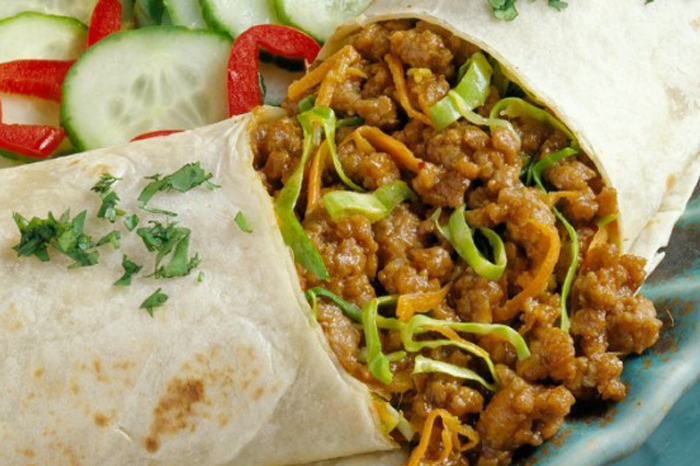 This is an easy, innovative and tasty way to use inexpensive ground pork. You can also use this filling and wrapped it into lettuce leaves for an even healthier dish. Heat large nonstick skillet over high heat. Add pork, cook, crumble and stir until pork is no longer pink, about 3-4 minutes. Add ginger, garlic, onion and coleslaw mix and stir-fry with pork for 2 minutes, until vegetables are wilted. Stir constantly to blend all ingredients well, about 1 minute. Combine all remaining ingredients except tortillas and cilantro in a small bowl and add to skillet. Cook and stir until all is coated, about a minute. Spoon equal portions of mixture onto warm tortillas, garnish with cilantro, roll up to encase filling and serve. Dissolve the sugar in the water in a small bowl. Add remaining ingredients and mix well. Refrigerate until ready to serve the lettuce wraps.